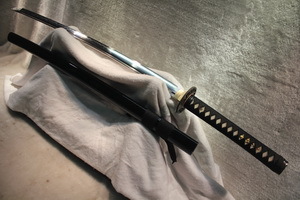 Mounting a Samurai Sword is a real art work; it is to painting an illustration, sculpting something beautiful or making a beautiful composure. 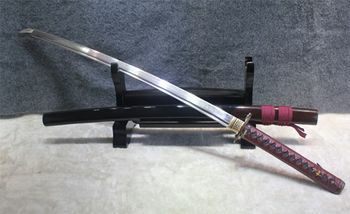 Considering the several parts that must be mounted and the names they have, Katana has never been a simple made weapon that Samurai used to carry hanged to their belt; it is a whole designed piece which every part is in harmony with the rest of the team. And if each part has its role and its particular designation, Fuchi Kashira is not an exception. Actually, the name describes two pieces that are placed differently though mounted on the same item. They are associated and tightly related to each other because one completes the other and has to be in continuity with it in the infinite detail. 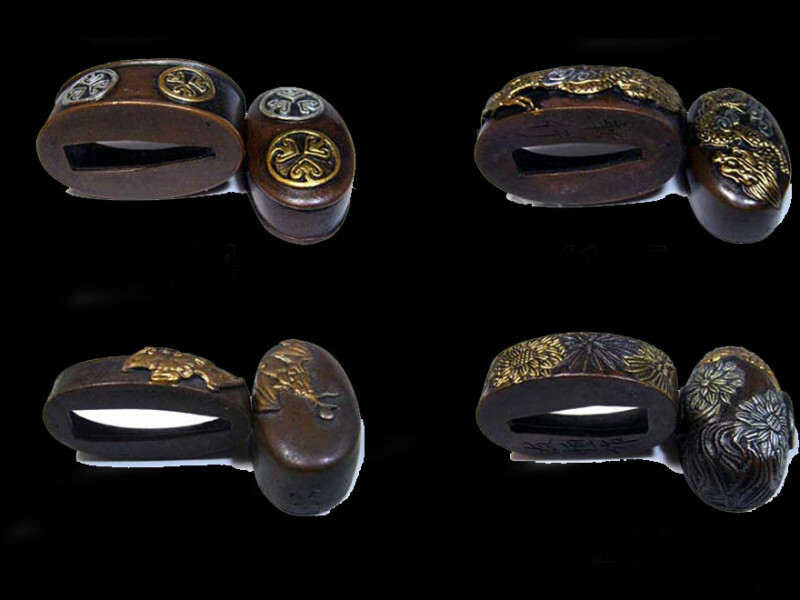 Fuchi Kashira have almost the same shape, the same ornamentation and are qualified as twin. But there is a main detail that allows the distinction of the Fuchi from the Kashira and it is a determinant differentiation point indeed. and they have the same patterns and ornamentation. 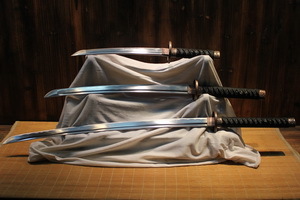 They are placed on the Tsuka, the woody handle of the Katana and they have a protective role for the Tsuka against looseness since Tsuka holds the Katana Tang and that allows the blade to be easily controlled and handled by the user; if the Tsuba loosen then the Tang would be free to move and that affects the Tsuka and may break it. Fuchi is the piece that covers and supports the upper part of the Tsuka; Kashira covers and supports the lower part of the Tsuka. Obviously, Fuchi will be performed with a triangular hole that allow the blade through, and that is the main difference between the two pieces of the unit Fuchi Kashira. As in the case of Saya and Tsuka, which are made of the same piece of wood and on the same way, Fuchi and Kashira are made the same way with the distinction that basically, Fuchi is equipped by a hole that intended to fit the blade and allow it through; Kashira has a lateral hole that is visible from both sides that may serve to attach it on the Tsuka. Fuchi is therefore the piece that is in contact with the parts from the Blade side. be in continuity with the several ornamentation that the Tsuka may carry. 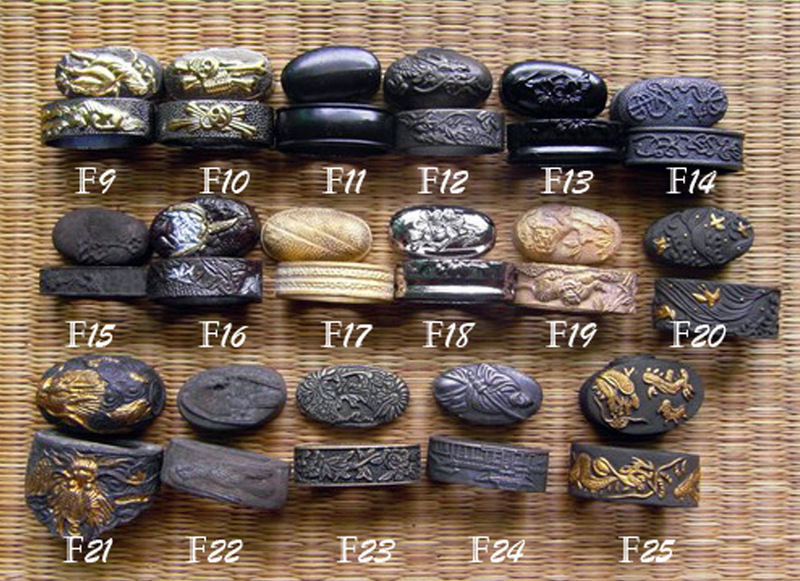 The basic shape of Fuchi Kashira is made of metal, generally Iron or alloys of soft metals. The pattern can be made of the same material as the basic shape and can be made of different material. 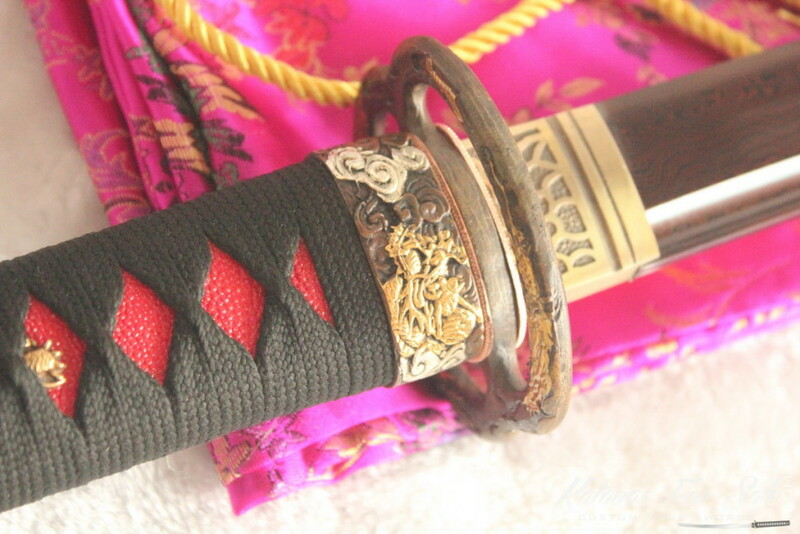 Generally the pattern is made of shining metal to be visible when mounted on the katana, and that can be Gold, Silver, Copper, Brass or simply iron metal. The unit is handmade; the basic shape is prepared and tested on the Tsuka to fit the upper border and the lower order. The metal is forged up on the dimensions of the Tsuka to help it sustain its form and stand the vibrations that may receive from the Tang. The pattern is then constructed and it is prepared on double sample: one to attach to the Fuchi, on one side , because the piece’s face would be performed by the triangular hole that may let the blade through, and the other sample is to place on the face of Kashira. Making the patterns is an important process that involves the knowledge and the proficiency of the pattern maker. 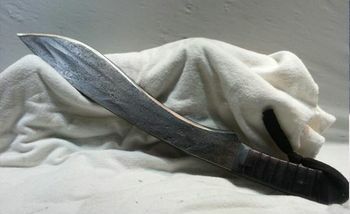 Also, it is important to notice the requirements of the demander and the factors included in the Sword making process and the mounting phase. Basically, Fushi Kashira are made with no patterns. They simply inherit whatever deformations that may result from the forging process. The pattern were introduced with the new techniques of metallurgy and heat treatments protocols. The evolution of the Fuchi Kashira designs is along with the evolution of the patterns on the Tsuba which represents the symmetry line between Fuchi and Kashira. 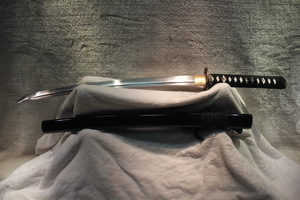 It is important to signal that with all the Katana parts, those which are directly visible represent social indicator according the complexity of the pattern designs and the material of construction. Actually, the richest sword owner would have the most expensive pieces made of onerous materials. While the modern pattern and pieces are more likely to be made according industrial processes using machinery, the most valuable pieces are hand forged and have the characteristics of being unique, due to the non conformity of a hand copy. Handmade pieces take more time to accomplish and require more precision and attention. Moreover, handmade pieces are signed by recognized makers, which add value to pieces and give the proficient label to the realization. Certainly there are some famous pieces of Fuchi Kashira. Their names are by reference to the pattern they carry or by reference to the maker. The main reference is the description of the pattern shaped on the unit. 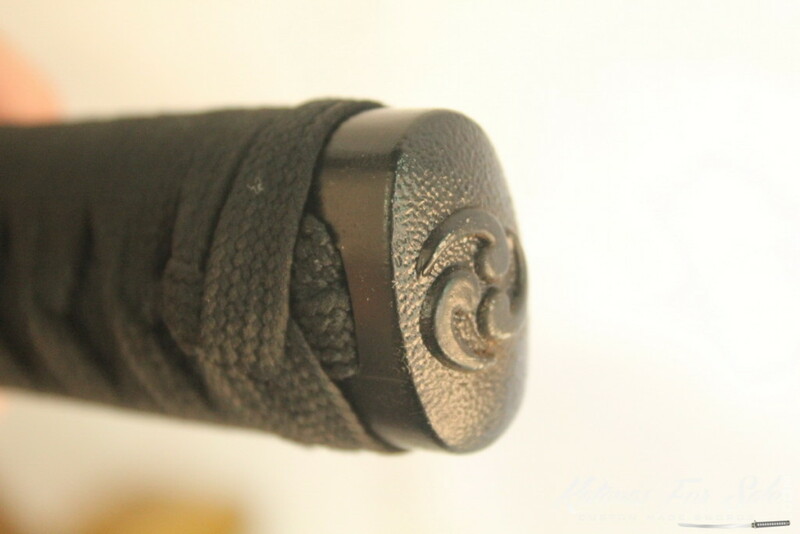 Usually, the pattern is extended to the Tsuba and the parts are often sold as one scene or as parts of the same pattern. The price of the unit is determined by the making process; usually the handmade items are more valuable. The complexity of the pattern and the material of which are made the several parts of the unit are thing to take in consideration. 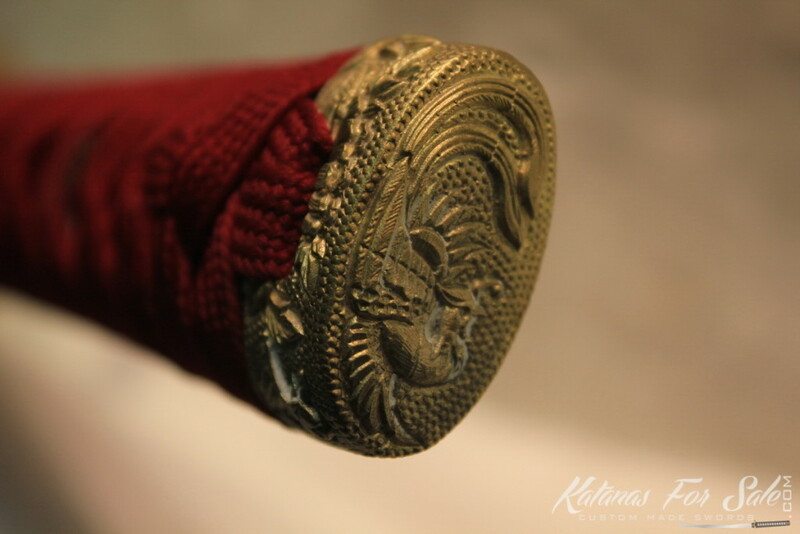 Choosing the right Fuchi Kashira to mount on its Katana is to select the units that are in harmony with the overall design of the Katana, that means in continuity with the Tsuka already implied by the nature of the Blade material and the Katana purposes. Also, if the Fuchi Kashira are ordered are separated pieces for collection, there are some other criteria that may apply: certainly the budget of the demander and the authenticity of the pieces to create. In most cases, the Created items are worth their prices.